When I first scanned this photograph at the Rhine Research Center I had no idea what was going on in the picture (aside from all the ectoplasm). I found out a day or two later. This guy is what’s called a “trumpet medium.” The dead spoke via a trumpet. A trumpet. Wait, is there there some sort of religious significance here? Anyway, at one time there were a bunch of mediums call trumpet mediums. (It’s just a little phallic too, isn’t it?) This particular trumpet medium is Ed Moore. 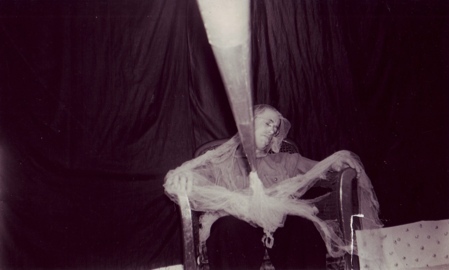 What is the ectoplasm in the photo? What IS ectoplasm? Whatever it is, that ectoplasm in the photo looks a lot like the fake spiderwebs you buy at Halloween. Seriously, what is it?